Visit the modern revival of this Race Track landmark! The Whitney Viewing Stand is located at the Oklahoma Training Track across the street from Saratoga Race Course. It allows everyone to experience a bird's-eye view of the horses' morning training sessions and workouts. This gorgeous landmark was dedicated to the Whitneys - one of thoroughbred racing's most dedicated and philanthropic families - in 2013 during the Saratoga 150 Celebration. 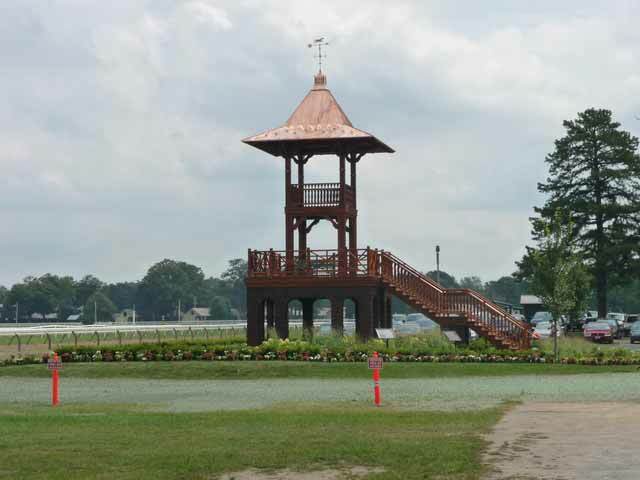 Modeled after the 1892 Judges Stand at the Saratoga Race Course, the Whitney Viewing Stand seeks to keep the rich history of Saratoga alive by combining the new with the old. The Oklahoma Training Track is located across the street from the main Saratoga Race Course track. The easiest way to access the Whitney Viewing Stand is via the Oklahoma Training Track's East Avenue gate. The Whitney Viewing Stand is open to the public throughout the summer meet from 6:00 AM to 10:30 AM. There is also a representative on hand to answer any questions. Did you know? In Congress Park, there is also an historic wooden carousel, featuring gorgeous painted ponies for kids to ride!